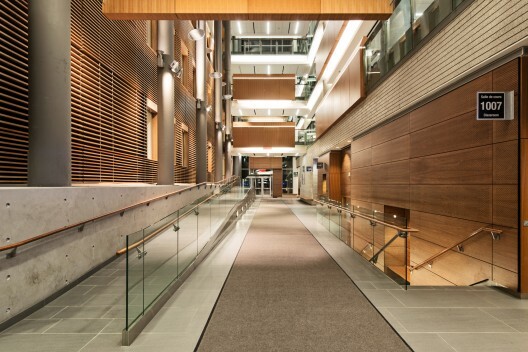 The building, designed by Diamond Schmitt Architects in joint venture with KWC Architects, features extensive classroom, student study and collaborative space on the lower five floors and connects with the renovated Vanier Hall via multi-level bridges that span a five-storey skylit atrium. 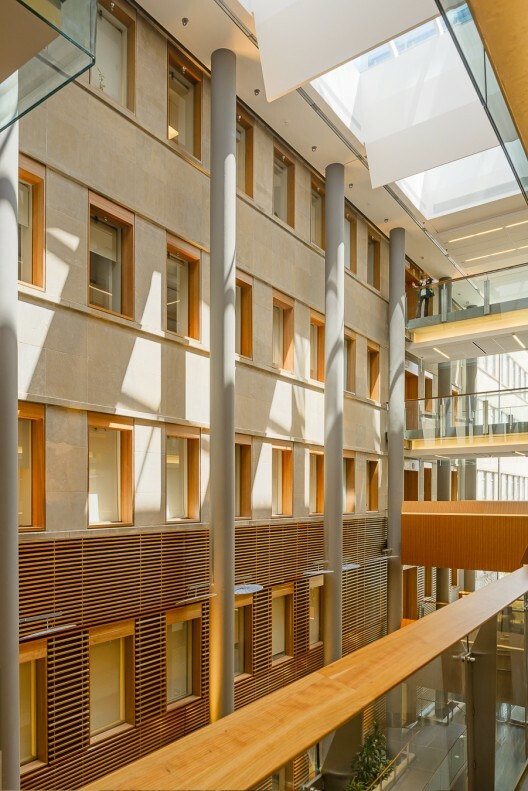 The upper floors house seminar, office and research space for faculty, graduate students and staff. 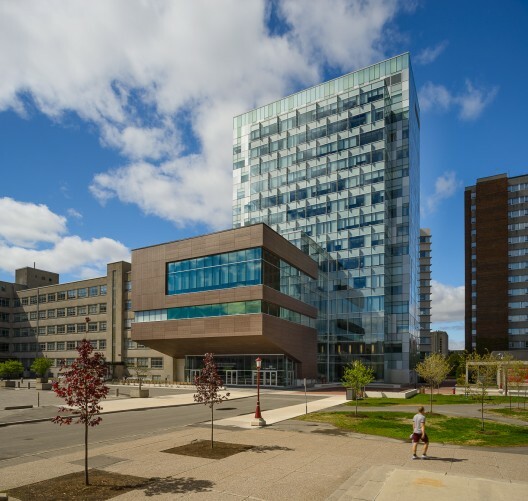 “Designed to efficiently occupy a marginal site at the edge of this dense urban campus, a new academic crossroads has been created,” said Donald Schmitt, Principal with Diamond Schmitt Architects. A six-storey pavilion with a dramatic 12-metre-long cantilever houses a 225-seat lecture theatre and a double-height reception hall with a green roof. The slope of the cantilever creates tiered seating for the theatre and forms the canopy over the main entrance to the building. The pavilion creates a terminus to the campus Grand Allée and maximizes the view corridor with extensive glazing in the reception hall. Dramatic views are afforded of the Rideau Canal and Parliament Hill from the tower. 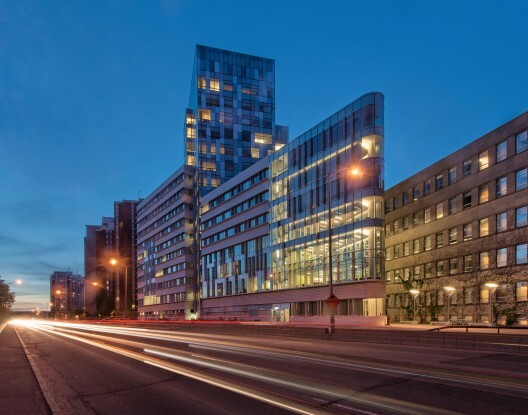 The massing and materials of the building are responsive to the varied conditions around the site with podia and pre-cast panels that emphasize the horizontal at the base of the building. 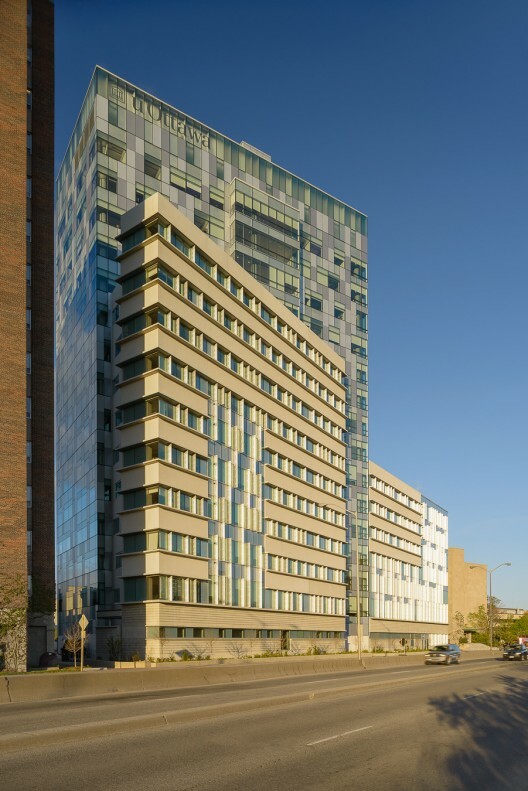 The curtain wall of the tower is designed to minimize its mass and consists of a mix of transparent, translucent and solid panels to address differing interior requirements. 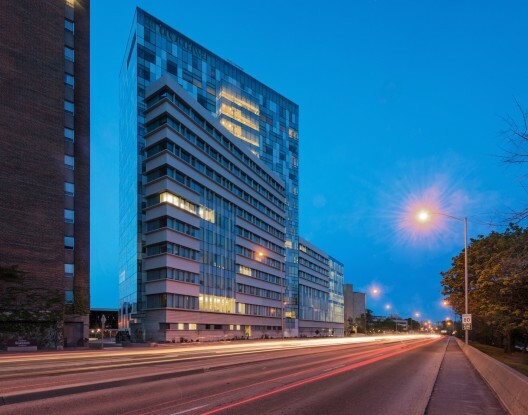 For natural light, a curved glass prow on the ‘flatiron’ form announces a new gateway to the Rideau Canal and the neighbourhood across the water. 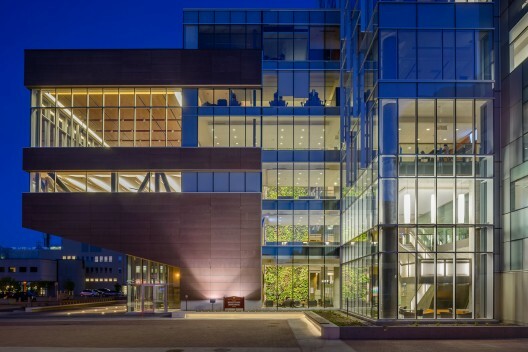 A signature feature of the LEED Gold candidate building’s sustainable mandate is a six-storey-high biofilter living wall – the tallest in North America. 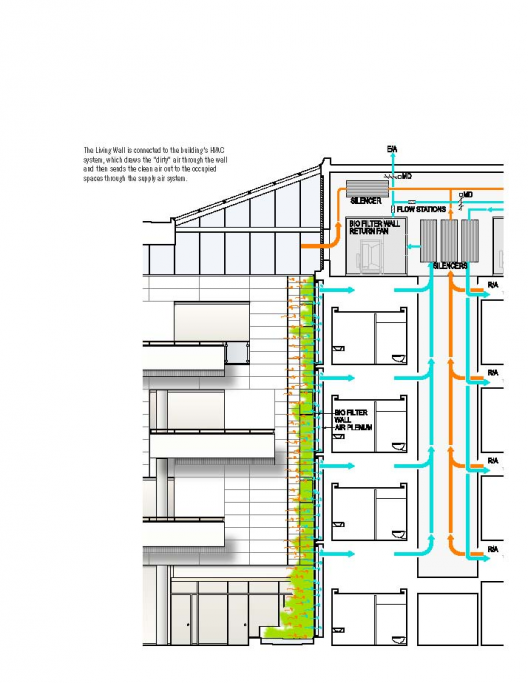 Diamond Schmitt Architects pioneered the commercial application of this energy-efficient air purifying process developed by Nedlaw Living Walls nearly a decade ago. 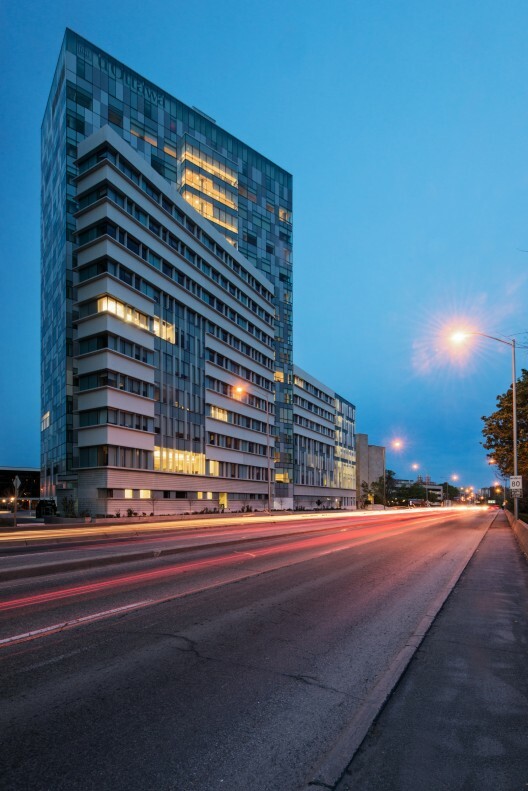 Diamond Schmitt Architects (www.dsai.ca) is recognized for sustainable design expertise in academic and research buildings, healthcare facilities, the performing arts, residential and commercial properties.